El Niño is in the news again. Headlines started over the airwaves and on the newsstands in February after NOAAs Climate Prediction Center (CPC) forecasted an El Niño for this spring. They announced that ocean and atmosphere circulation patterns as well as sea-surface temperatures were ripe for an El Niño to develop over February, March and April. With forecasts continuing into March, the headlines also continued  some cautious, some alarming, but all pointing toward an imminent change in our air and seas. But not all climate researchers agree an El Niño is coming, and some scientists are looking toward new signals to help better predict El Niños in the future. These opposing viewpoints represent uncertainty surrounding an emerging science. 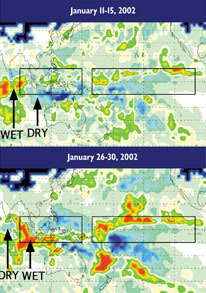 Satellite data during January 2002 for the Indian and Pacific Oceans show precipitation anomalies, with wet regions in green to red colors and dry regions in blue. Over 15 days, a seesaw of precipitation occurred in the eastern Indian Ocean, a possible signal for El Niño development. An experimental prediction indicates that by July to October 2002, the western Pacific (left box) will be drier than normal, and the central Pacific (right box) will be wetter than normal  conditions of an El Niño event. Image is courtesy of Scott Curtis. And for that reason, David Adamec, an oceanographer at the NASA Goddard Space Flight Center, thinks CPC announced a forecast too soon. I thought it took a lot of guts to issue a forecast like that, Adamec says. Kousky explains, however, that it is in NOAAs mission to provide information to the public as soon as it is available, and that their available data showed the right warm water conditions. What CPC was relying on, Adamec says, was a strong, persistent, anomalous gust of wind starting from Indonesia in the western Pacific and moving to the Americas in the eastern Pacific. Pacific trade winds usually blow from east to west. It is these anomalous westerlies that climate researchers believe trigger an El Niño, pushing the warm pool of water in the western waters east, where the waters are usually cold. This warm pool of water affects weather globally  rains that normally soak the western Pacific slide toward the Americas. Adamec says that until researchers better understand the genesis mechanisms behind the phenomenon, predicting an El Niño will continue to prove difficult. Fortunately, climate scientists are working toward a better physical understanding of El Niño, developing new predictive tools. Bob Adler and Scott Curtis of NASA-Goddard are looking at the Indian Ocean for early signs of El Niño. In work that will be published in an upcoming Geophysical Research Letters, Adler and Curtis present a statistical relationship between precipitation changes in the Indian Ocean and the initiation of an El Niño. Using global precipitation data that date back to 1979, they observed a pattern that precedes El Niño event by six to nine months. Turns out the climate of the Indian Ocean can sometimes be characterized by a gradient of precipitation between the center of the basin and the coast of Sumatra Indonesia, says Curtis, also a professor at the University of Maryland-Baltimore County. In January, Curtis observed that the gradient had been oscillating over the winter months, as seen by large and rapid changes in precipitation between the two areas. At the same time, over the previous six months, the eastern Indian Ocean near Indonesia was receiving excess rain while the central Indian Ocean was remaining drier overall. And that pattern of precipitation, Curtis says, has preceded the past five out of six El Niños, missing the weakest event. Curtis and Adlers observations of this pattern in January corroborate the CPC prediction for the current El Niño. Its interesting that our oscillation for this year coincided with flooding events that occurred in Indonesia. Its also interesting that a regional climate phenomenon seems to be affecting the global weather pattern and the El Niño development, he says.